When the reigning queen of online beauty turned her hand to complexion products, we were expecting a lot – and this utterly flawless loose powder does not disappoint. Certain to have the beauty world in raptures, this is the silkiest finishing powder we’ve come across. Brilliant for baking, it also keeps make up perfectly in place, blurs the appearance of pores and fine lines and absorbs shine, all without creating a white cast or ‘flashback’ in photographs. There are eight sweet treat shades to suit a wide array of skin tones, each of which leave an airbrushed matte finish with a hint of sheen, leaving you looking luminous while controlling shine. 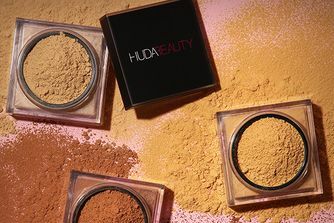 Not content with keeping our lips, lashes, lids and cheeks looking flawless, Huda Beauty has unveiled the secret to perfectly ‘baked’ make up looks: Easy Bake Loose Powder. Supremely smooth, silky and ultra-finely milled, this sublime powder blends seamlessly into skin leaving a soft, velvety matte finish with a hint of sheen that’s a million miles from cakey, drying powders. Blessed with a beautiful, petal-esque perfume, it’s perfect for baking, setting make up in place all day long, blurring the appearance of fine lines and wrinkles and controlling shine throughout the day – all without creating a white cast or causing ‘flashback’ in photographs. Paraben-free, non-comedogenic and enriched with protective vitamin E, the easy-to-use loose powder leaves a beautiful airbrushed finish, subtly colour correcting and highlighting and leaving a translucent veil of colour on your skin – so you can bake without the cake! To suit your skin tone, there are eight sweet treat-inspired shades to choose from, including ‘Cupcake’, ‘Banana Bread’, ‘Cinnamon Bun’ and ‘Coffee Cake’, alongside neutral 'Sugar Cookie' – so grab your brush or blender and get ready to bake! Apply a generous layer of powder under the eye, T-zone, laugh lines, outer corners of the mouth, and chin. Let powder bake for 3 to 5 minutes. Gently dust away excess powder. -	Apply a light amount of powder all over your face to remove shine and set any liquid formulas applied. -	Use throughout the day to touch up, and control shine without the cake. Sugar Cookie - Suitable for all fair to tan skin tones. Neutral undertones. Ultra-brightening. Cupcake - Suitable for fair to light skin tones. Pink undertones brighten and disguise under-eye darkness. Pound Cake - Suitable for fair, light, medium and tan skin tones. Golden undertones brighten and disguise under-eye darkness. Banana Bread - Suitable for light, medium and tan skin tones. Golden undertones brighten and disguise under-eye darkness. Blondie - Suitable for light, medium and tan skin tones. Golden undertones brighten, while pink undertones disguise under-eye darkness. Kunafa - Suitable for deep tan and rich skin tones. Golden undertones brighten and disguise under-eye darkness. Cinnamon Bun - Suitable for rich skin tones. Golden undertones brighten and disguise under-eye darkness. Coffee Cake - Suitable for rich skin tones. Golden and red undertones brighten and disguise under-eye darkness. Really loved it and it’s has a beautiful fragrance, it’s so light and feels so smooth on the skin . It's really amazing. It lasts ages and it makes your skin so soft. So easy to use and blend and truly brightens. I defo think it's worth the money and I really love it. BEST ADVICE- use it in moderation, powders tend to make your skin very dry. Her products are literally the best and this is no lie, before I bought this I used to use the revolution powder in the shade banana but this actually does the job. I have really oily/acne prone skin and this keeps my face matified for a very long time. Thank you Huda and Cult beauty for this. Absolutely love this powder. I have been looking for a yellow based powder for ages! The Laura Mercier only comes in translucent and it isn't really translucent on my skin tone. This one is so finely milled and perfect for my skin tone! First time buying this product from Huda and I was a bit skeptical at first but I will admit that it will be a must in my make-up bag. The best baking powder I’ve tried, Sets my makeup all day and eliminates any skin texture. I have dry skin and this powder does not cling to any dryness. Only powder I use now, would highly recommend!! Best setting powder i have ever used! The powder itself is great, i do not mind the smell. One problem i had is that the powder will just NOT come out no matter how much i flip it and knock on it. I eventually had to cut a hole in the net. Got the shade cupcake, it smells so nice! One of my favourite settings powders and is now part of my everyday makeup routine. Finely milled and high covering. Love HUDA! Looks nice but fades away fast. I ordered blondie it was too yellow for me even its says it has also Red tones. This is soooo goood! Never gonna use anything else again! I loved the smell! Banana bread is the best loose powder for my NC42 skin! I have tried almost every single loose powder (Laura Mercier one that EVERYONE uses is horrid on me - too finely milled, sinks into fine lines & dissipates into a hot mess!). This keeps my concealer in place ALL DAY while keeping it matte and fresh. PERFECT! Honestly such an amazing powder, gives full coverage, and makes your face look totally flawless, does not leave any marks. It’s difficult to get the products out of the netting and when the powder does come out it’s that thin it flys everywhere more than what gets on the brush it leaves skin feeling soft where it’s applied but I find Laura Mercier powder to be much better. I did not like this powder at all. It has a really strong scent that I didn’t like, I found it difficult to get the product through the netting and found that after about an hour or so my makeup flaked off and left dry patches. It may work better for oilier skin, but I didn’t like it at all. I wanted to find an alternative to my favourite CT Airbrush Flawless powder and oh yes, this product has replaced it. Very silky smooth, never overdone, not drying. I have the shade Cupcake and it’s amazing for my undereye. You get a very good amount of product so it will last you quite some time. I love dipping my dampened Beauty Blender into the mesh, then rolling the excess of on my hand and then setting my undereye. Never darkens my concealers (Shape Tape, TF Born this way Multi-sculpting, KKW, Lancôme). Yes it is scented but I didn’t find it particularly strong. If you are sensitive to smells than probably it wouldn’t be for you, otherwise, great product. I love this! I have dry under eyes so I was surprised how well this worked on my problematic area. My skin just looks so dewy and PORELESS. I’m recommending it to everyone I know. The smell was pleasant and didn’t bother me at all. The shade I got was Pound Cake. I am so happy, its an amazing powder, I get the shade Blondie and I love it very soft and beautiful powder. This powder is really good, sets everything in place and doesn’t move at all or let oils through, but the smell is really gross. Horrible if you’re setting around your nose, you have to hold your breath. The packaging is also quiet annoying. It's hard to get powder out the sifter. Apart from smell and annoying packaging, I would recommend. I love this product, the texture is so soft and matches my skin. Smell like a fragrance. I bought this in shade banana bread and it leaves an amazing/flawless matte finish & a highly brightened under eye, furthermore it smells awesome. I love makeup with a nice scent. Deffo recommend this. I have never 'baked' before and I got this to try and would now never look back. It is not drying at all. It leaves a soft focus, velvet, airbrushed finished and extends the longevity of my foundation. I put it on with a dry tapered beauty sponge and dust it off after 5-6 minutes with a small fluffy brush and it works a treat. I ordered the shade Cupcake and I personally think this is much better than the Laura Mercier. I was worried about it being so finely milled as I felt it might show all my fine lines but it does the opposite. It makes my skin look beautifully smooth and my makeup holds up all day (I have oily skin). It’s great for brightening your under eye but I use it to set all over too. Also, I LOVE the smell! This is one of the best products i’ve ever come across. I have a very oily skin but even after 10 hours, my makeup is still looking good with this easy bake powder and I haven’t even retouched my makeup. It has finally given me this glassy finish and has worked like magic for my skin. I dont think im ever gonna go back to using any other setting powders. I wouldn't advise girls with oily skin or even combination skin to use this setting powder. I feel like the whole claim for the powder to make you look airbrushed is a lie because my smile lines are always more noticeable when I used this. I used it with different foundations, concealers, primers and it still had the same result. Quite unfortunate. Also my friends use the powder and found that it made their pores stick out way more, so its a no from me. Try Beauty Bakeries powder in yellow and thank me later. A splendid powder, which has a good array of shades. Does what it says on the package. Made my makeup look flawless and airbrushed. I use this alongside my Sephora microsmooth powder. Between the both of them, I am loving the results. I'm not really satisfied with this product mainly because of the smell. It smells like her foundation which I don't really like. I can't really see any "magic" that any other loose powder can't do. I mean I did not see a difference in my face it wasn't any smoother after putting it on even if I did follow every step suggested by Huda herself. I guess I'll stick to my Givenchy loose powder. By the way great service from CB as always! I bought the powder in the shade Pound Cake and I absolutely love it. It left my skin feeling and looking airbrushed!. The smell is actually not that bad once applied. I absolutely love this powder! I have tried many before which are either too drying or just don't sit well on top of other make up products but this is one of a kind. I bought the shade cupcake which is spot on pairs perfectly with faux filter foundation, leaves me looking poreless . As others have noted it is perfumed but it does not bother me nor my skin and I have suffered severe cystic acne for almost 13 years. none of Huda's products reacts with my face. It is perfect with the bake and blends brush but any kabuki or damp beauty blender will do. I have heard nothing but good from this product so naturally, I tried it with very high expectations. And I'm still amazed by it. Even though I have dry skin, it wasn't as mattifying as expected, there was no creasing under my eyes whatsoever, my skin looked incredibly smooth, almost photoshopped, and stayed like that for the rest of the day. I mix it with a white baking powder though because the colour I bought is a close match to my actual skin colour, so it's better to set with it, rather than baking alone. 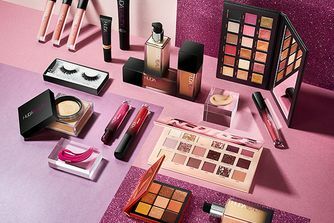 My only concern is that it is heavily perfumed, flowery scent that is typical to Huda's products is almost unbearable to be personally and I smell it both when opening the box and applying it on the face, but not afterwards. It works just as well with a (damp) beauty blender as with a kabuki brush. The texture was super soft and very luxurious. This powder is way too translucent for baking. It’s a good setting loose powder but I will not be using it for under-eye baking. World&#8217;s best powder. No lie! Well damn. When I first bought this powder I did know that it was good but I didn’t know that it was this good. Seriously perfect! This makes my skin look so buffed out and the fact that it doesn’t have any flashback on pictures is also great! The first time when I tried this powder, I really had to get use to the matte finish. It made my face and especially the area around my nose a bit dry, but after using the powder two times, my face got use to the effect this product gives and it is amazing! Without this powder, my make-up routine wouldn’t be finished. I have issues with textured skin and fine wrinkles around my eyes and mouth. Normally if I set my face it's very cakey and wrinkles look worse than before I put my makeup on. This is very finely milled and does an excellent job. Very pleased! Thanks I like all my orders from Huda Beauty. This leaves a velvety smooth airbrushed finish and makes the skin look flawless. i've purchased it in the banana bread shade but will also purchase in pound cake for a more brightening effect. One of the most amazing baking powders I ever had. This is great for baking under eyes and smile lines. It sets everything so perfect and does not cake up. You can’t cake this powder and can’t look powdery. It disappears. I guess this powder will win prizes. I want a compact version Huda. Ordered the shade Blondie. It sets great and works perfect for my oily to combination skin. I dont mind the smell though. It lingers for a little bit but then goes away. Overall a Great setting powder! It's so good and it smell so Good. I really like this powder, it holds my makeup very well but the smell is something that I don’t like so much because I’m so sensitive with that. It's the best powder I have ever used because it doesn’t dry my skin too much! I love this product it is my second purchase it is the best setting powder yet. I work shifts and after 2 hours my make up still looks flawless. Best buy. This powder deserves a lot more hype. The smell isn’t something I love but the blurring, soft focus effect it has on my skin is worth the scent issues for a couple of minutes. You get so much product for your money too. I've tried loads of powders before... but this one has to be the best yet. Although it is a bit pricey, totally worth it! Depends on way of use. I got the shade banana bread and it was too dark for my complexion(nc 20) which was obviously my fault for choosing a bad colour. I don’t think it’s necessarily a “bad” baking powder. However, I think that for the price, you can get a much better powder. It is very finely milled even more than the Laura Mercier but I do find it creases very quickly even when I bake. I usually use Laura Mercier translucent powder which is amazing as is this powder! The scent is my favourite thing and the finish is very smooth without being too cakey. I would definitely give this a go if you're wanting something that works well with your skin tone. Really nice powder, gives a beautiful smooth finish. The only negative is the scent is very strong, if you are sensitive to scents I wouldn’t use it. A lovely powder lasts all day without settling into lines better than my Laura Mercier. This is a wonderful powder but I don't like the way it smells and I prefer powders with no fragrance. Also the packaging is not practical because when you open it there will be powder everywhere. Not drying with the satin finish. Looks really good under the eye area. I like this rosy scent. Lovely powder! So light. I use it for baking under eyes or just as a finishing powder. Smooths skin and reduces shine straight away. I wouldn’t say it lasts all day but does a pretty good job and just needs a wee top up later in the day. First Huda product and I’m impressed! A very very drying powder that created so many lines under my eyes! I have combo skin and this was such a waste of my money. Totally blown out of proportion! The best loose powder on the market! It is indeed a great product for a flawless and smooth look. I use banana bread shade for baking my under eye areas and forehead where I have fine lines and its the place where I sweat a lot. 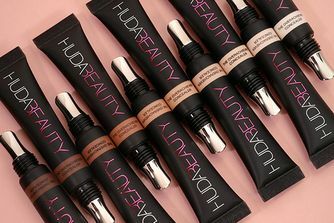 After using Huda Beauty easy bake my makeup has been so soft and it reduced the appearance of fine lines and my sweating too. Only con is its not available in India. The only setting powder that keeps me as matte as possible, without looking caked at all! I have combination skin, tending to look oily even without foundation. Finally found my holy grail, I‘m so happy about that. Only con: it’s breaking me out A BIT! But it’s up to me, because every primer & setting powder is breaking me out. Am I the only one that absolutely loves the smell, Flawless finishing look! I`m an oily skin girl, but my under eye skin is dry. First off when I use this powder to set my face with wet beauty blender it causes me textured skin (I always set my foundation like this) So the only way I can use it is with a brush (not my favourite method). It keeps my skin matte for a good amount of time, but my under eyes are getting really dry. Although the smell is awesome. This is fantastic for baking, it makes the under eye look smoothe and youthful, the colour they added makes it look nice and natural instead of that white cast that translucent leaves. I am very fair and I use cupcake, I suggest not getting any lighter than cupcake because this has pigment to it and sugar cookie will leave you looking like you have a white cast. Cupcake is fantastic. I think you could set your face with it's just fine. It pairs so well with shape tape and Nars creamy radiant concealer. I really like it and it’s sweat proof as well, it has a milder version of the foundation scent which I really really love. I love this, Huda Beauty has some amazing products. This looks better than my Laura mercier! This powder is amazing, so finely milled it’s like silk in your hands. I have the colour pound cake and I’m like an NC30 skin tone and this is perfect. I use a sponge to pack this in under the eyes, over the nose and on the chin and forehead. I then use her brush to dust it away. I think Huda does it the right way, brings out one product at a time and it’s perfect not loads at the same time. I've been using Laura Mercier setting powder for quite a while because all the reviews have always been so positive but being so pale, it always left a yellow tint on my face and I was unsure of which powder to change to. I was not disappointed with Huda's. I bought Sugar Cookie and I was a little hesitant at first with it being a totally white powder but I am amazed. There is no tint to my skin, my bronzer sits on top perfectly and it has completely hidden all my fine lines which is something Laura's struggled to do and. I would 100% recommend. I want to add as well that I don't really "bake" but use it as an all over setting powder using a damp sponge. THE best powder I’ve used. My face stayed matte all night with no touch ups needed. No foundation transfer or anything! No flashback and you don’t need too much either! I’ve tried Laura Mercier and Kat Von D powder but this one is better than both! (I got the translucent colour). Love it. Works well under my eye. Flawless makeup. One of the best baking powders I've tried. The smell is nice and the texture is super smooth; when applied it really brightens the face and masks the subtle imperfections. The only negative is the price, it's unnecessarily expensive for a baking powder, and kinda puts you off.